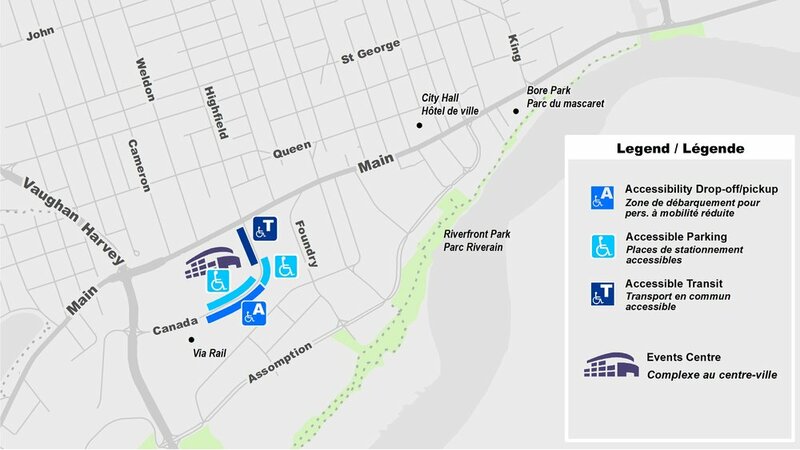 Accessible Parking: There are a number of accessibility parking spots on Canada Street for the Events Centre. You can access these spots by entering Canada Street from Main Street. These are offered to patrons on a first come, first serve basis. Accessible Drop-Off: If you or someone in your party is planning on driving to the Centre, turn on Canada Street from Vaughan Harvey Blvd. (like you’re going to Via Rail). Follow the signs on Canada Street to the accessibility drop off where those with mobility issues can be dropped off. To exit, you can then proceed out Canada Street to Main Street and travel north to Highfield Street or turn right on Main Street. In either direction, there will be free on-street parking. Accessible Drop-Off: If you or someone in your party is planning on driving to the Centre, turn on Canada Street from Vaughan Harvey Blvd. (like you’re going to Via Rail). Follow the signs on Canada Street to the accessibility drop off where those with mobility issues can be dropped off. You can then proceed out to Main Street and travel either north on Highfield Street or turn right on Main Street. From there, follow the Events Centre parking signage for directions to both city and designated private paid parking lots. Ability Transit: Wheelchair accessible buses are available to citizens in the Greater Moncton area. Each bus is equipped with hydraulic lifts and tie-downs for passengers in wheelchairs and also has room for 4 seated passengers. Please contact 506-853-3055 to make arrangements for this mode of transportation or visit the Ability Transit website for more information. Codiac Transpo: For persons who use wheelchairs, Codiac Transpo could be an option for you. Depending on the timing of the event you are attending, you may be able to travel by bus directly from your neighbourhood to and from the Events Centre. Codiac Transpo has 7 wheelchair accessible routes presently serving Moncton (#51, #52, #60, #61A, #62, #64, #65). Buses along designated wheelchair accessible routes are either equipped with one or two wheelchair spaces. Should you choose this option please plan to leave well in advance to assure you arrive at your event in good time. Please visit codiactranspo.ca for a wheelchair accessible route and schedule near you and to see if the timing of the event you are attending fits Codiac Transpo’s regular scheduled runs. For more information on maps and schedules click here. If you’ve never taken the bus before, try the Google transit trip planning tool… it’s a great way to plan your trip. If you would prefer speaking to someone from Codiac Transpo’s call center, please call 857-2008 week days between 7:30am and 4:30pm and they would be pleased to assist you.